A cute little skunk perfect for Valentines Day. We've added Swarovski crystals to the eyes and the rose for that sparkly look girls love! Font shown on shirt is available as a separate purchase. Please see the Related products tab. 4x4: 3.89 x 3.21. SC: 9259. 5x7: 4.91 x 5.96. 14,382. 6x10: 5.91 x 7.16. SC: 17,744. 8x8 or Durkee Hoop: 7.25 x 5.97. SC: 17,863. A cute little skunk perfect for Valentines Day. We've added Swarovski crystals to the eyes and the rose for that sparkly look girls love! 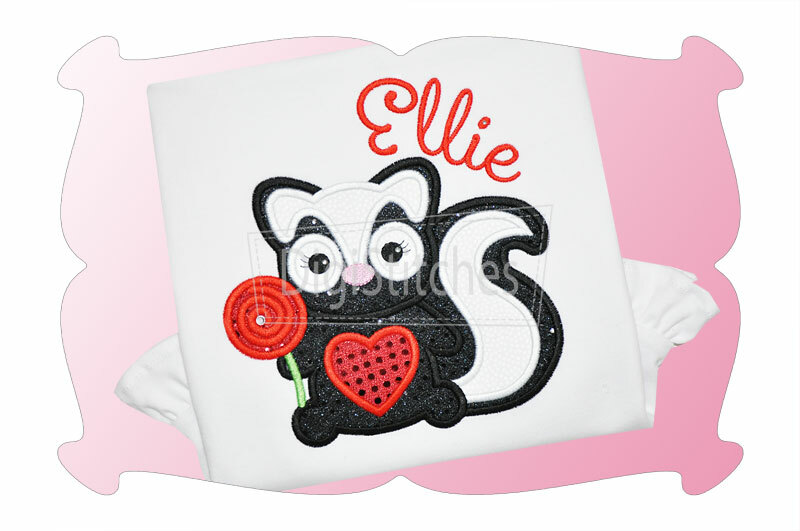 The "Valentines Day Skunk" applique comes in 4 sizes. All sizes included with your purchase!